If Donald Trump was planning to drain the swamp, he certainly wasn’t talking about the military-industrial complex. Trump has officially nominated John C. Rood for the position of Undersecretary of Defense for Policy, the Pentagon’s third most powerful job. Rood is a senior executive at Lockheed Martin, and before that, had a senior position at Raytheon. With Rood’s nomination, all three of the Pentagon’s highest leaders will have had recent positions with major defense contractors. Defense Secretary James Mattis was a board member of General Dynamics, while Deputy Secretary of Defense Pat Shanahan was a senior executive at Boeing. To put it another way: the top trio at the Pentagon have recent close ties to, and have profited handsomely from, the top four US defense contractors. 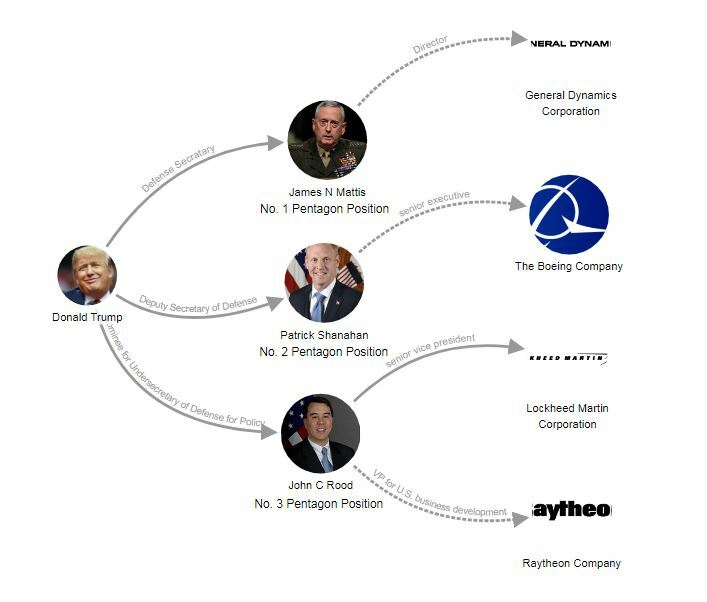 The ties of Trump’s top three Pentagon appointees to the four biggest U.S. defense profiteers. See the map at LittleSis.org. Prior to his appointment to senior vice president, Rood was Lockheed’s vice president of government affairs, where he played a managerial role in overseeing the “government relations activities” of the company’s US field offices. Before he joined Lockheed in 2014, Rood had worked for Raytheon, another defense industry powerhouse. Rood was Raytheon’s vice president for U.S. business development. He joined Raytheon in March 2009. According to Business Insider, Lockheed is the top defense contractor in the US, with $29.4 billion in federal contracts in 2016, while Raytheon ranks thirds, with $12.3 billion. Rood’s earnings at Raytheon and Lockheed Martin are not disclosed in SEC filings, but top management at these companies are well compensated. The most recent Lockheed Martin proxy statement shows that in 2015 its CEO made over $20 million, its executive vice president and CFO made $7.5 million, and two of its executive vice-presidents made over $5 million. 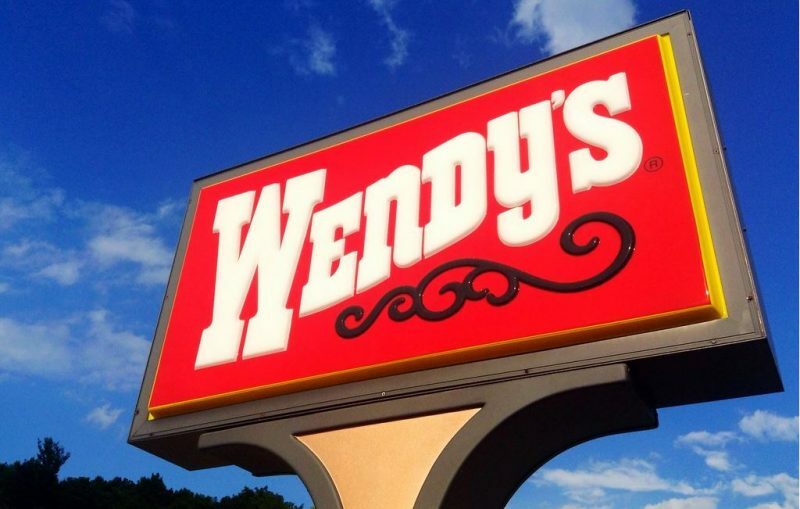 Though below the very top tier of executive leadership, Rood’s senior management role likely made him very wealthy. 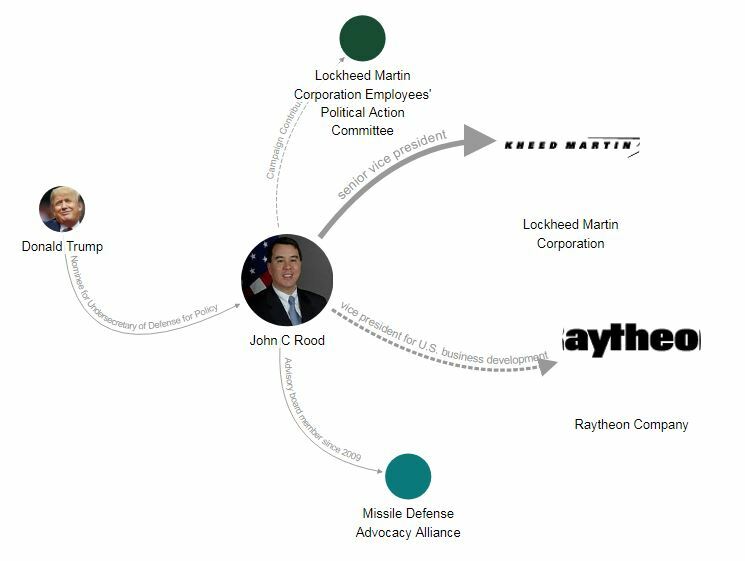 John C. Rood’s defense industry ties. See this map at LittleSis.org. Prior to entering the private defense industry in March 2009, Rood had a lengthy twenty-year career in government. In fact, he went to work for Raytheon just mere weeks after the end of the Bush administration, in which he served, in January 2009. A running theme throughout Rood’s government career is his work around weapons systems, especially missile defense. Rood began his career working for the CIA sometime around the late 1980s, where, among other responsibilities, he analysed foreign missile programs. After eleven years with the CIA, he became senior policy adviser to Arizona’s former Republican Senator, Jon Kyl. Rood stayed with Kyle for four years, leaving in 2001 to join the National Security Council. 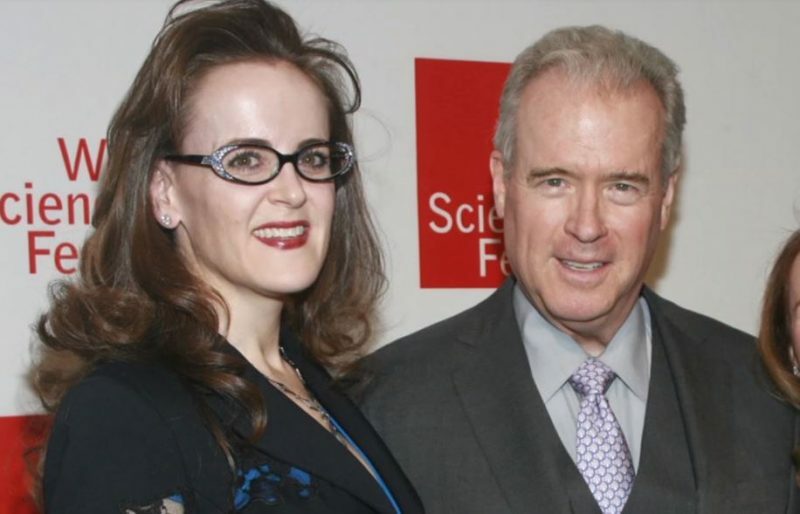 From May 2001 to September 2003, Rood was the Director for Proliferation Strategy, Counterproliferation, and Homeland Defense at the National Security Council. From September 2003 to February 2005, he served as Deputy Assistant Secretary of Defense for Forces Policy. From October 2006 to September 2007, he was Assistant Secretary of State for International Security and Nonproliferation. 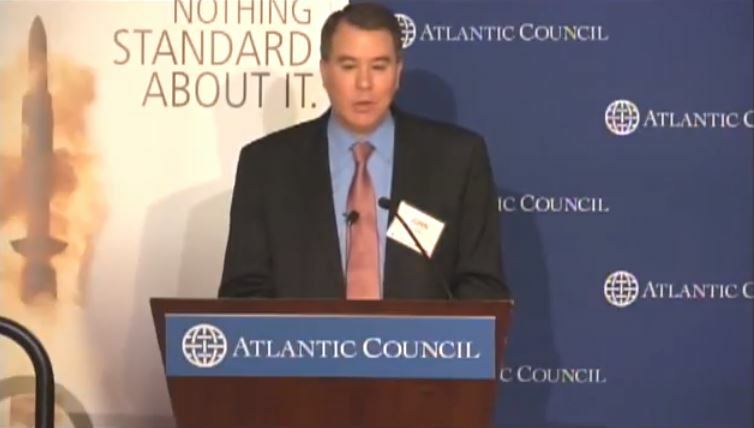 From September 2007 to January 2009, Rood was Acting Under Secretary of State for Arms Control and International Security. Rood left the Bush administration in January 2009, when Obama was inaugurated, and quickly stepped into his lucrative eight-year career at Raytheon and then Lockheed Martin. Rood has an interesting connection to a somewhat cryptic pro-missile defense non-profit run by an ex-NFL linebacker. The MDAA is run by former NFL linebacker Riki Ellison, who is its founder and chairman. The Twitter profiles of both MMDA and Ellison are filled with news concerning missiles, weapons productions, and defense companies, and images of Ellison with politicians and other figures. In 2014, the most recent year for which compensation figures are available, MDAA paid Ellison $375,000. In years prior to 2014, he has also been paid hundreds of thousands of dollars. Ellison has taken loans from MDAA; for example, in 2014, he was loaned $51,000 as an advance on his bonus by the MDAA board, which, in 2014, contained only three members besides Ellison (the MDAA website currently has only one board member besides Ellison). MDAA claims it is a “non-partisan organization” that “does not advocate a particular company, system or product,” but this claim to impartiality is compromised by the revelation that in 2012 it accepted at least $40,250 from defense contractor Northrup Grumman, $7,625 which was used for lobbying purposes.The MDAA took in close to a million dollars in contributions in both 2013 and 2014, but it doesn’t disclose its donors. But more broadly, MDAA is committed to lobbying for the expansion of weapons systems from which the defense industry as a whole profits. Ellison lobbied Congress, the White House, the Pentagon, and the State Department constantly from 2003 to 2013 to “advocate the testing, development and deployment of missile defense systems.” In 2003, Ellison reported $400,000 in lobbying compensation, though later filings don’t report lobbying expenses of more that $5,000. Rood also sits on the board of Youth Impact Program (YIP), a non-profit which Ellison founded and chairs and to which MMDA advances tens of thousands of dollars. Rood is one of just three YIP board members besides Ellison. Trump’s nomination of Rood was enthusiastically celebrated by Ellison. “Missile Defense Dream Team lining up! 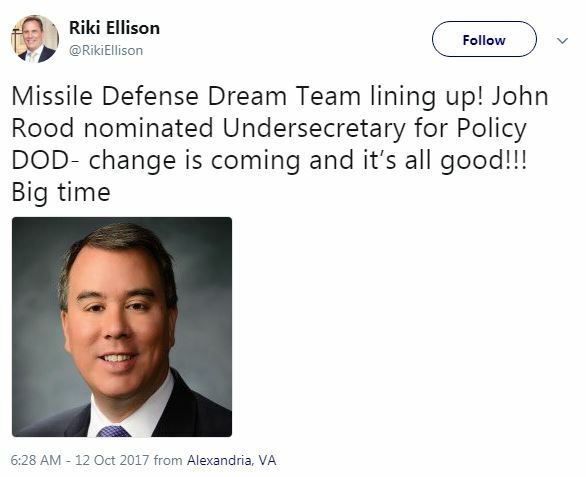 John Rood nominated Undersecretary for Policy DOD- change is coming and it’s all good!! !,” Ellison tweeted. Rood’s ties to MMDA and Ellison suggest that his appointment to a top-ranking Pentagon position meshes with Trump’s reported support for building up missile defense systems — and the ramped up military spending that would go along with that. Rood’s nomination is just another example — albeit an important one, given that he’ll occupy the third highest position in the Pentagon — of the revolving door between the defense industry and the Trump administration. Trump’s nominee for Army Secretary, Mark Esper, made $1.5 million last year as a Raytheon Lobbyist. Army Under Secretary Ryan McCarthy is a former Lockheed Martin executive. Benjamin Cassidy, Assistant Secretary for Legislative Affairs for the Department of Homeland Security, was a senior executive at Boeing, and before that, a lobbyist for Raytheon. Chad Wolf and Lora Ries were appointed as Department of Defense advisors at the Department of Homeland Security. Both are former Boeing lobbyists. David G. Ehrhart, Trump Air Force General Counsel nominee, was Associate General Counsel at Lockheed Martin Aeronautics. And the list goes on. With Trump and Congress set to boost military spending, the defense companies that figures like Rood are connected to may stand to profit more than ever.